Last year I decided to invest in a simple tool found in virtually every home in India. 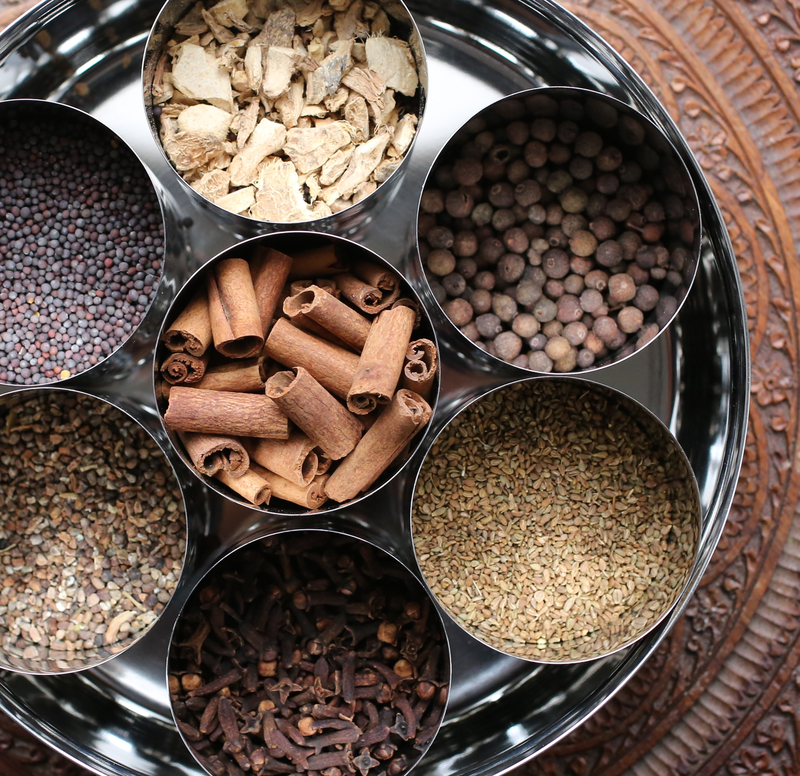 I bought a masala dabba or Indian spice box, a simple yet clever way to organize spices. 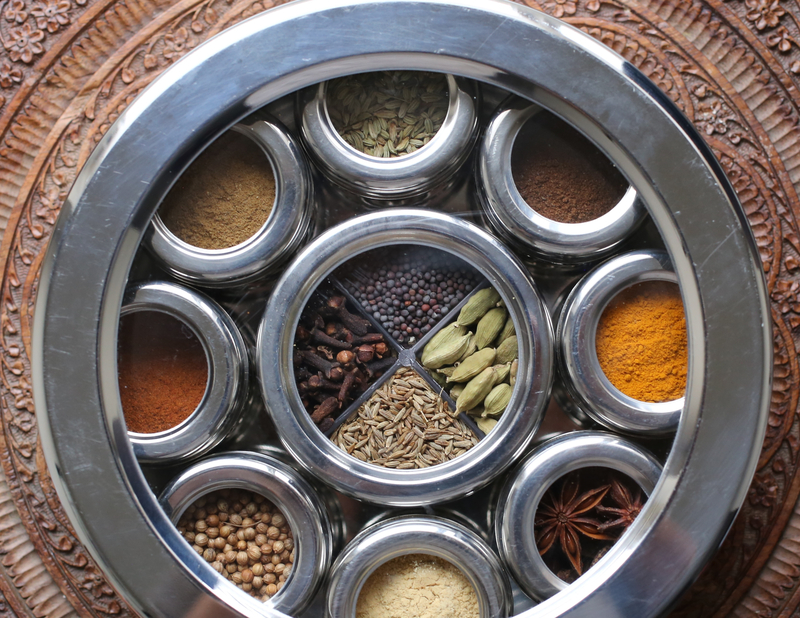 A round stainless steel tin with a tight-fitting solid or glass lid, a masala dabba typically holds seven or more smaller canisters that house an array of spices that often flavor an Indian meal. I love my masala dabba. Not only is it simple and practical, it’s also visually stimulating. Shiny and bright, I can’t help but smile each time I look at it and see the vibrant spices it holds. I also love its rich tradition. In India, masala dabbas are traditionally passed down from mother to daughter when the daughter marries and begins a new life in her husband’s home. This is done so that she enters her new home with everything she needs to prepare well-flavored and aromatic meals for her new family. I find the sentiment endearing as it shows you don’t always need expensive equipment to cook wonderful meals for the ones you love. 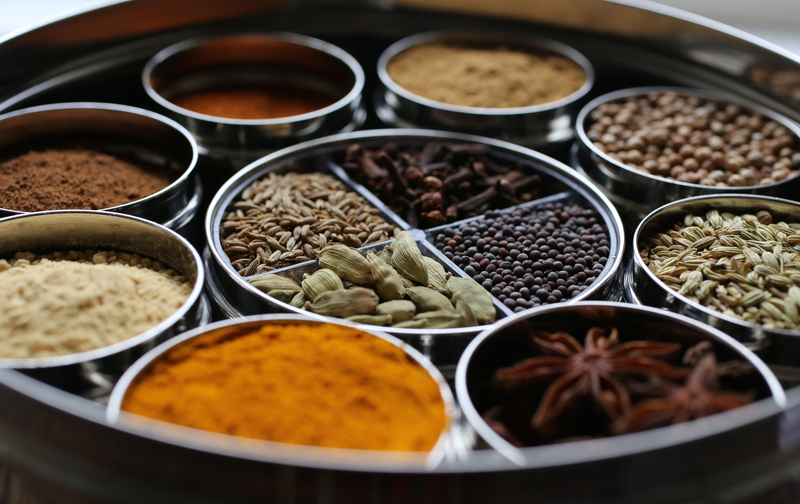 The spices that are held in a masala dabba vary as it depends on the cook. It’s really a matter of personal taste. 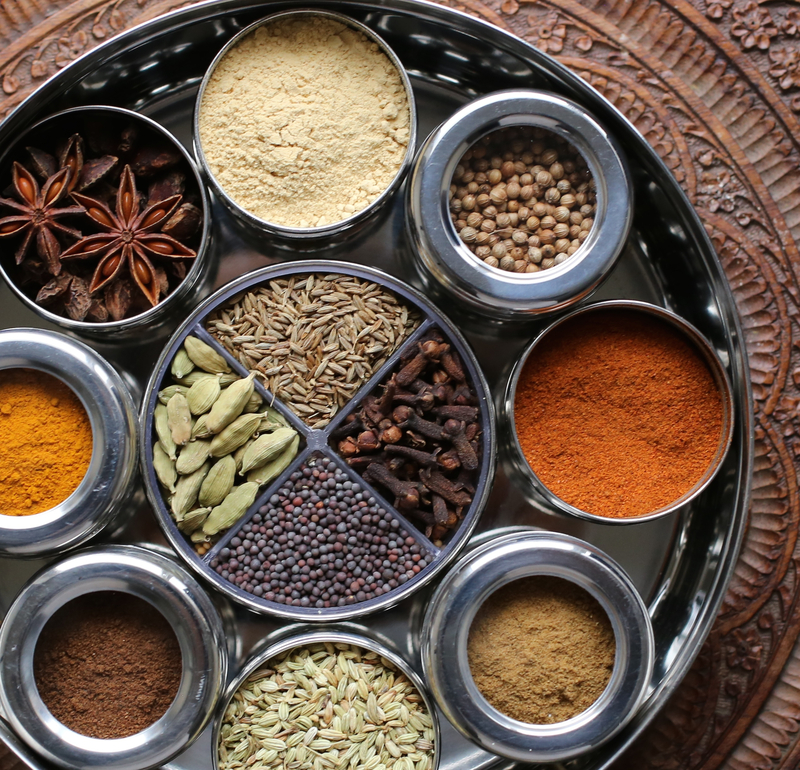 In India, if you travel around the country you will notice regional variations in foods, spices held in a masala dabba, and even the number of dabbas found in each home. I have two masala dabbas. One, pictured above, my “fancy” dabba, has an outer lid of glass and it has individual glass lids for each of the nine canisters inside. Each canister has its own transparent lid to preserve the quality of the spices and also makes it quite easy for me to see the spices it holds. It is slightly different than most traditional dabbas in that it has nine inner canisters and each of those nine canisters has its own lid. I like this as it ensures the scents of the spices don’t affect one another. I also like that I can place a tight lid over my ground ginger, for example, and not worry about it falling into the other spices in the box. My other dabba (pictured below) is not as fancy. It also has a glass outer lid, but its inner canisters don’t each have individual lids. It looks similar to the fancy one above, but it is more traditional in that it only has seven canisters inside. The canisters are a little larger, but each of those canisters do not have their own lid. I prefer to put ground and whole spices in my fancy dabba with individual inner lids and only whole seeds and spices in my more traditional dabba (the one without individual inner lids). At first I tried putting ground spices in the latter and accidentally spilled coriander into my cumin. Lesson learned. So I stick with the whole spices and seeds for that dabba. In it I have whole allspice, whole cloves, dried ginger pieces, cinnamon sticks, cardamom seeds, all spice, and mustard seeds. Something else that’s great about a masala dabba is that you can personalize it and make it your own. For instance, it does not have to be used only for Indian spices. You can also use it for any of your favorite herbs or spices used in your daily cooking or for spices used in a specific cuisine. Alternatively, a masala dabba can also be used to hold beads or other collections of small items. What’s in your dabba? Thank you and you’re welcome. Glad you like it! I really like this. The masala dabba really makes the spices look lovely! It would be a joy to open up and used while cooking. Nice post. Thanks, it really has been a joy to use! I want to buy this masala dabba how? This is exactly what I need – a masala daba (or two)! Thank you for opening up my eyes to something new, fun and delectable, Martine. Where do you buy your spices? They all sound lovely – the flavors we love. Thanks Shanna! And, you’re welcome! I’m happy to share things or ideas that I find useful and/or interesting, fun, practical, and beautiful! I actually buy most of my spices from the grocery store. If I happen to enter a specialty or ethnic market and find an interesting spices, I buy them. I love learning about and trying new spices! Hi…where is young this masala dabba from? Regarding the spices above, to be a little more specific, I believe I got the cardamom pods from an Asian market and the mustard seeds from a health foods market/store. I think I may have purchased everything else from Whole Foods. Regarding other spices (not photographed above) that I have in my pantry: For the Herb Kuku dish I posted in January, I was looking for the spice Fenugreek, I finally found it in a Turkish market as well as the little health foods market I frequent. And, for the spicy edamame dish I posted, I bought the Togarashi spice on line from Amazon. Other than the few odd spices, I can often find a nice variety of spices at my neighboring grocery stores. I hope that helps! Hi Shanna, Just FYI, I updated this post with a little more info and photos. My mom has one. But I always worry: won’t the spices impact each other in such close quarters? as in the smell of one getting absorbed by another one? Do I make sense? Hi Azita, yes, you make sense. I totally understand your concern and I’m sorry I wasn’t more clear in my post. In a nutshell, my dabba has individual lids to avoid the problem. I’ve updated my post with a better explanation of the differences between my two dabbas and how I use them. I also posted a few more photos of my “fancy” dabba with their little lids! First, what a beautiful photo. The photography and the subject. Other than star anise, I have all the spices in the original bottle. I have same question as Azita. How do you keep the aroma of one to effect the other? Do they have individual caps? Thank you Fae. Yes, the dabba I have on the post has individual lids. Apologies for not being more clear. I updated the post with more information about my two dabbas and how I use them. I also posted photos of the dabba with the individual lids. Feel free to let me know if you have any other questions! Martine, They look beautiful! 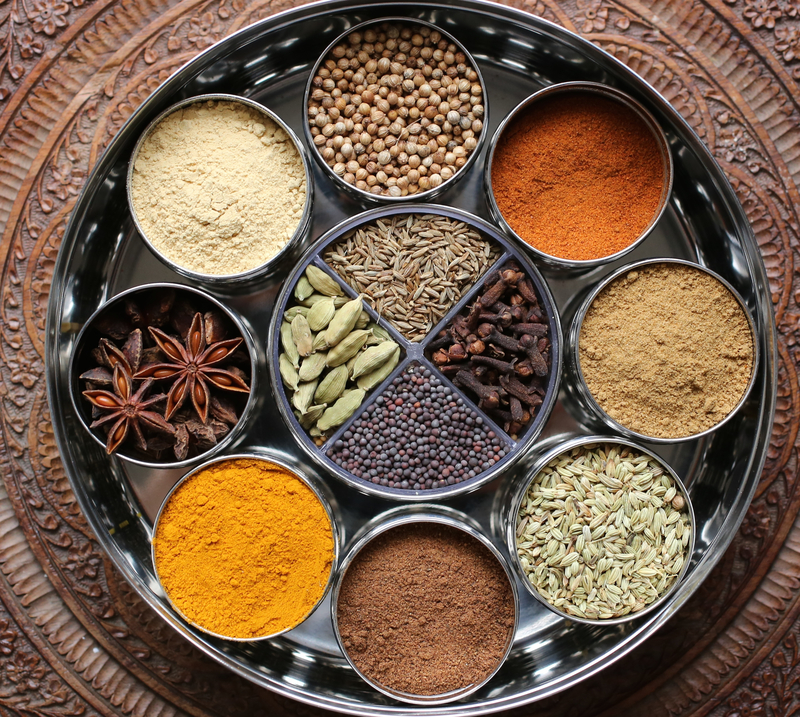 Masala dabba/Indian spice box, a jewel box for spices! A great way to describe it Fae! 🙂 Thank you! What a beautiful spice case. Thank you for sharing it with us. Such a gorgeous photo! Thank you Amanda and you’re welcome. I love sharing things and ideas I find interesting and helpful. I’m glad you like the spice box. The variety of colors and textures of spices made the photo a real joy to take! Thanks again! Hello, thank you for your question. I bought my masala dabba online. The brand is The Three Sisters Masala Dabba. I bought mine without spices. Got to find me one of these for sure! Good luck. I love them! Forgot to mention that the other reason I prefer each little container to have a marked lid is that open ones do not identify what seed or ground spice you’re looking at. Cayenne and paprika look a lot alike as do ground coriander and cumin! Very true, some spices do resemble each other quite a bit. There are some masala dabbas that provide marked containers, with their lids free of marking. It’s helpful to have the container filled with the spice to be marked instead, just in case you should happen to accidentally mix up the lids! Here’s to keeping the spices organized! Can you please tell me about how many ounces each small container holds? When I buy spices in our Indian store, the spices come in plastic bags it’s always much more than I need and more than any spice jar will hold. Hi Sarah, I understand your dilemma. My dabba photographed above has 8 small canisters which each hold about a half-cup of spices, and a center canister which is slightly larger (but note it is divided into four compartments). As mentioned in the post I have another, more traditional dabba (no individual or transparent lids) which has larger canisters. 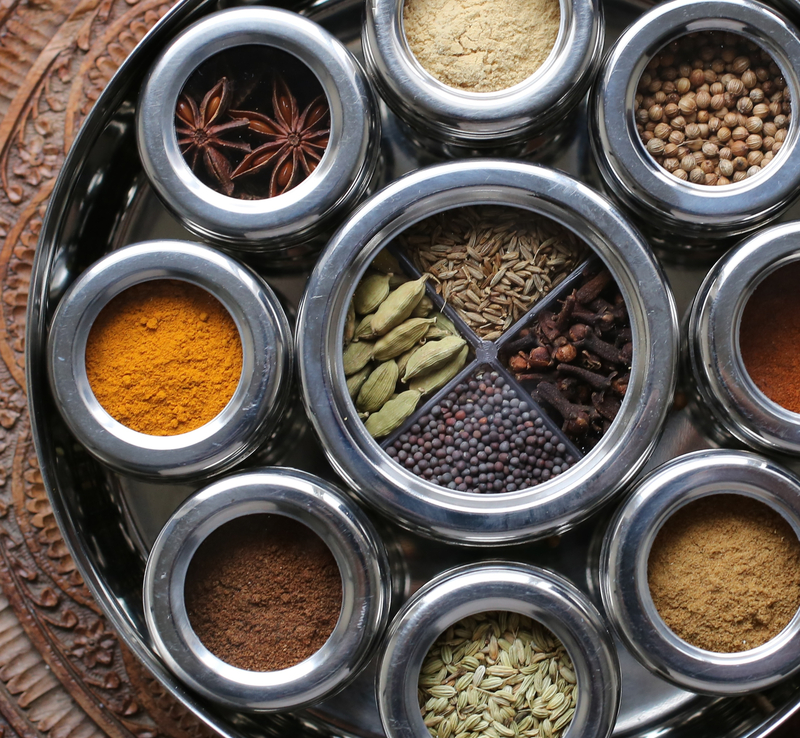 Each of the seven canisters in this dabba are of equal size and hold about one-cup of spices. So a dabba with larger canisters may be more helpful to you. However, depending on the size of the bag for the spices you buy, you still might have to store some of your spice in a bag as the container in your dabba might not be large enough. I hope this helps a bit. If you have any more questions, please feel free to let me know. My other dabba is not from The Three Sisters. Unfortunately, I don’t know of the brand because it is not marked. It just says, “Made in India”. I just did a quick Google Image search and found several that look like my second one which has a see through (glass) outer lid. In your search you can look at the details to check for size, but I believe most of them, besides fancier ones like The Three Sisters, are larger and about the same size. The Spice Tiffin made by Indian as Apple Pie has an interesting dabba in that each of the individual canisters have levelers. I haven’t tried using theirs but it looks interesting. Good luck in finding the perfect dabba for your needs! If you have any other questions, let me know! Hi Lisa, I got mine from “The Three Sisters”. If you do a Google search for masala dabbas you can find it as well as many other varieties of beautiful and practical dabbas. If you have any trouble or have any more questions, please feel free to let me know! Lovely post. I would love to know where you purchased your deluxe dabba. I have been looking for one but so far the only one that I have found was similar to your simple one but the lid was not tight enough to protect the spices. I bought mine on Amazon. Three Sisters is the company that makes them. Hi Lisa, thanks for you comments and suggestions/advice! I got mine online through Amazon. They are also available at most Indian grocery stores. In love with your beautiful blog and pictures. love the covered masala dabba..just ordered one for myself. Keep inspiring, keep writing, keep sharing..it brings so much joy to read and to look at visual feasts of photography that you share. Cheers!